anlabyhouse: Men at work - on my studio. 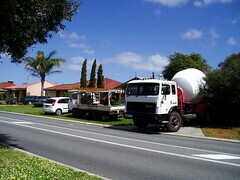 I stood on the verge over the road to take this photo of the workmen's vehicles out the front of our house. I was standing in front of yet another truck with a bob-cat on the back while I photographed the cement mixer vehicle, a truck full of wheel barrows and shovels etc and one of the young "boys" car. As you can see, I live in suburbia, however we don't have houses across the road, we have grassy areas, a creek, then a railway line which carries freight trains and in the winter months we get the occasional preserved steam train and behind that, paddocks and the hills of the Darling Ranges..